I suggest a new strategy George. Let the mouse win. The news yesterday that Disney was acquiring LucasFilm and along with it, the Star Wars franchise led many in the blogosphere, twitter and every sub-editor in the media jump for joy. Never before had so many puns become available for some many headlines in such diversity. But at the same time, there was the realisation that Star Wars had not ended as many of us had believed. There was (ahem) a new hope. No one had dared speak the phrase “Episode VII” since, well, Episode I came out. Alongside all of this was another shot of nervousness about Disney. But Disney has always been the natural home for Star Wars. Come on. Search your feelings. You know it to be true. 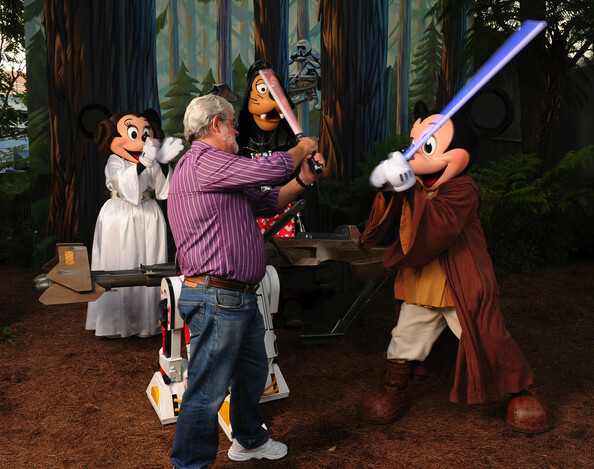 The Disney theme parks are steeped with Star Wars. Indeed, they are its most popular attractions; from Star Tours to various Star Wars activities for kids to a morphing of Disney characters into the Star Wars universe. On occasion, LucasFilm has allowed spoofs to come forward to build on Star Wars but over the last two decades Disney itself has invested in Star Wars but always with a remote choke point. This is perhaps no more apparent in the movement of technology assets. Steve Jobs bought Pixar from LucasFilm, transformed it into a better version of Disney and then sold it to Disney. Thus, LucasFilm technology reached Disney first. Now, the remainder will come along and with it Industrial Light and Magic. Everyone is focussed on Star Wars but ILM is the big piece here. Disney now owns the premiere special effects supplier for movies and beyond (TV and video games too). It will own the patents that goes with all of that. After all of that, the decade long technology transfer to Disney will be complete. What I think is terrific is how the Disney marketing dangled a new Star Wars film out there to divert attention away from the upstream technology consolidation that surely will have the biggest impact on the entertainment industry. “This merger is all about Star Wars,” they said. “This merger is all about Star Wars,” the media repeated. “Move along.” They didn’t even need The Force to perform that mind trick. Next PostNext What are publishers afraid of with device restrictions?